Music is for the moment – and ephemeral. With these CDs the Octavians conserved the musical highlights of their past. 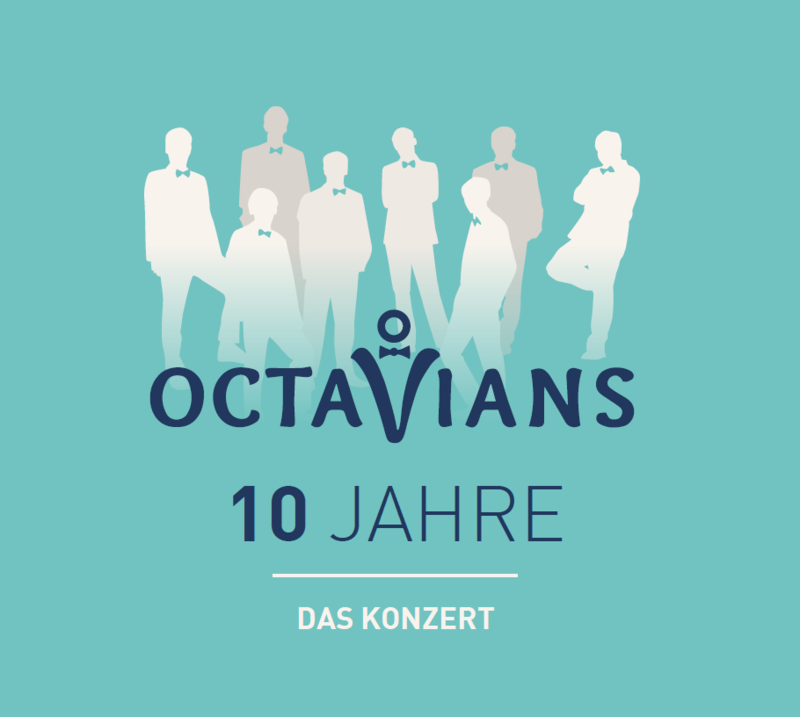 10 years Octavians – the concert! Die Octavians haben sich endlich ihren Traum erfüllt und haben ihr legendäres Jubiläumsprogramm auf DVD gebannt. Für schöne Abende gibt es als Höhepunkt das ganze Programm auf CD mit dazu! Zusätzlich zu DVD und CD kommt ein edler Schuber. Bald erhältlich! 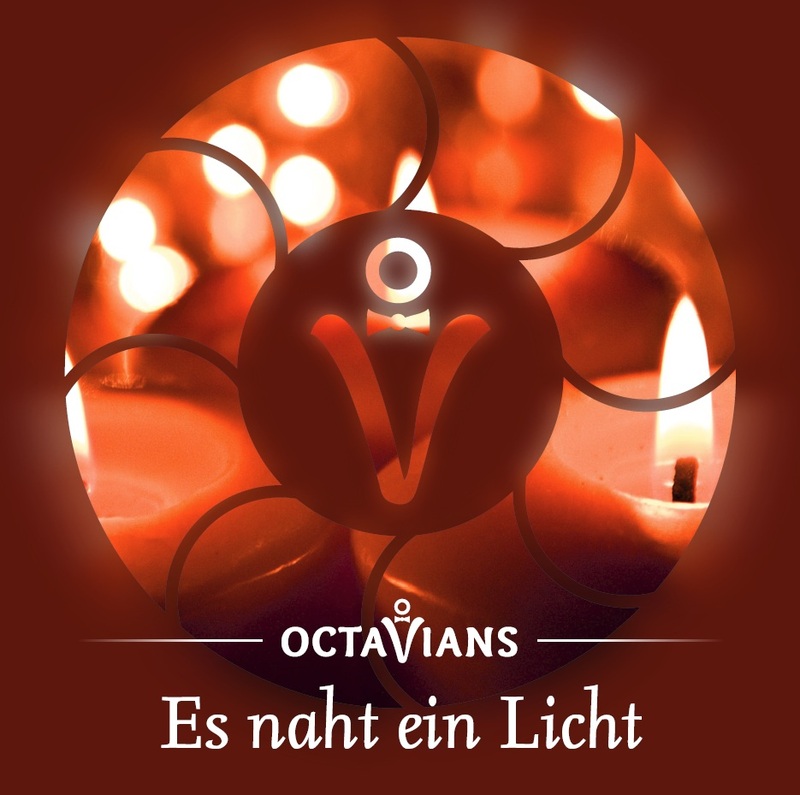 With this CD the ensemble Octavians wants to present three moods, which they musically connect to Christmas: the mystic of the advent of the birth of Jesus, the affectionate wonder for the child in the manger and last but not least the hilarious and rather worldly joy for the occasion of this Birthday. Every Singer has his own history and emotions with every one of these songs. 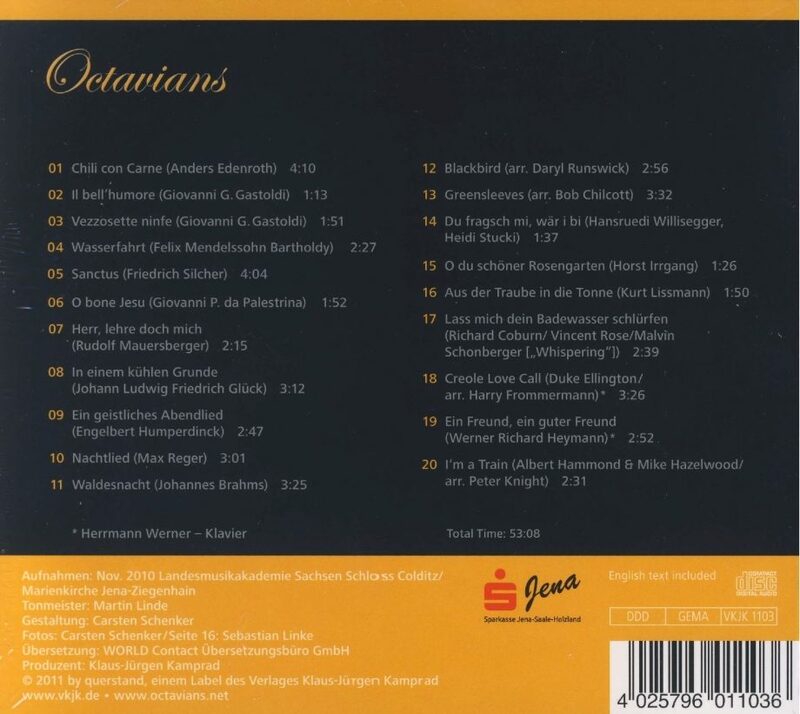 With this CD the Octavians present their second professional recording. It is based on a live-recording of the annual "Jahreskonzert" in fall 2012 in Jena. The songs impress with arrangements of the famous Comedian Harmonists, Jazz-standards and fashionable Pop-music. For the first time the Octavians present unique compositions which were provided by renowned composers such as Fredo Jung and Indra Tedjasukmana. The Octavians were accompanied by Michael Ebert on the grand piano for some songs of this recording. 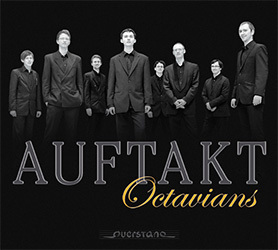 The CD titled "Auftakt" is the Octavians debut-recording and offers a broad overview of the artistic spectrum of these talented young musicians. The 20 songs were recorded in the medieval church "Marienkirche Jena-Ziegenhain" (St. Mary’s Church Ziegenhain) and in the recently opened state music academy in Colditz "Landesmusikakademie Sachsen auf Schloss Colditz". With this CD Bundle you can enjoy the ultimate listening experience. 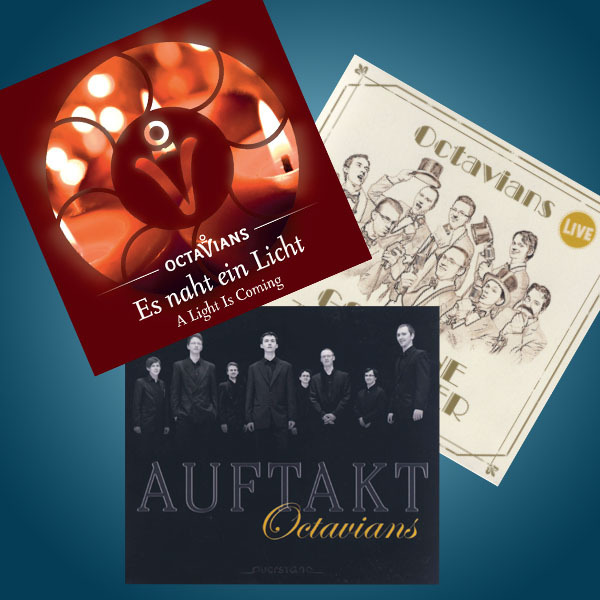 This bundle delivers all three records: the debut “Auftakt”, with a broad spectrum of Songs from 500 years of music history. 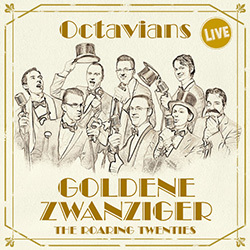 The second CD “Roaring Twenties” with the best of the famous Comedian Harmonists and Jazz of the roaring twenties. The crown jewel of the bundle is the recently released Christmas CD “A Light Is Coming”. 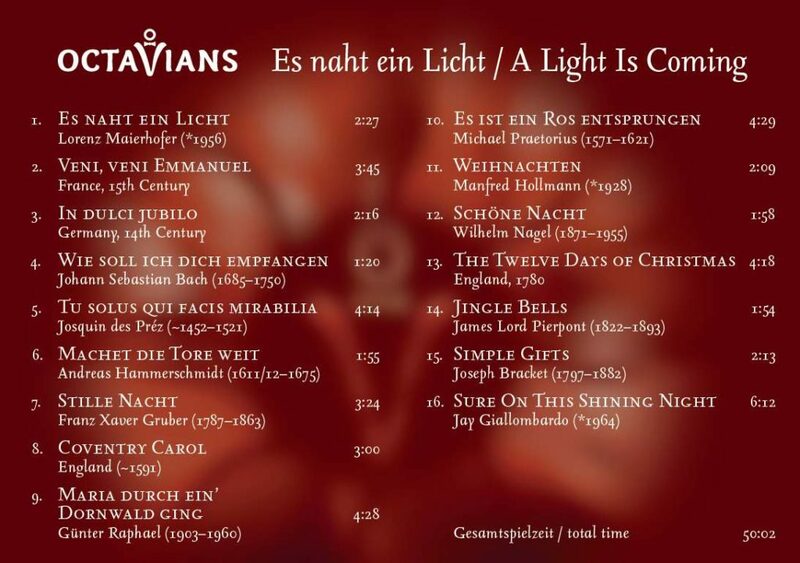 On this record you can enjoy some of the most beautiful german and international Christmas songs. Buying this bundle you save 5€ versus buying each CD separately. To ask for an order request, please submit your desired CD and fill out the underlying form. Then we get back to you to let you know our bank account and the invoice amount.